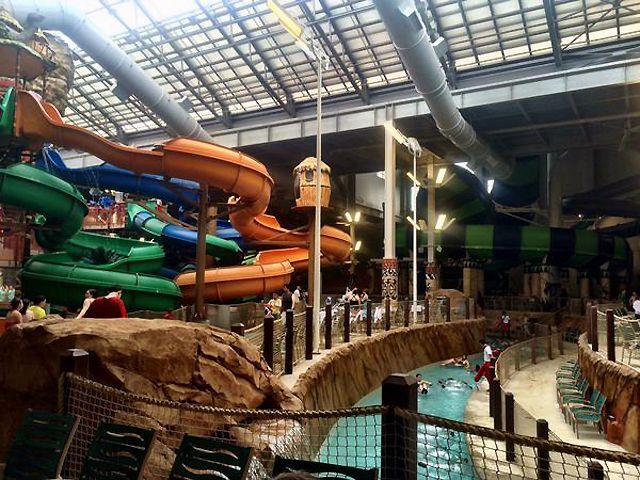 The Poconos Kalahari features the same kind of indoor water park fun as the chain's other African-themed resorts in Sandusky, Ohio, and Wisconsin Dells. The Kalahari locations are among the largest indoor water parks in the country and offer a wide array of water park attractions. At 150 acres and a $350 million price tag, the enormous Pennsylvania park rivals its sister properties in size and scope. More than just a water park, the resort includes an arcade, bowling, indoor mini-golf, and a virtual reality 5-D theater. There is an onsite table-service restaurant as well as a buffet, snack bars, a coffee shop, and a sweet shop with candies, ice cream, pastries, and other treats. "Kamp Kalahari" offers activities such as movies, crafts, and storytelling for younger guests. Visitors should expect a full-fledged resort that is geared to families with children and includes plenty of options, both wet and dry, to keep everyone busy. It isn't all kid-centric fun and games, however. Unlike most indoor water park resorts, the facility also reaches out to business and meeting planners with a 65,000-square-foot convention and function complex. Trade show, meeting, and event attendees are encouraged to bring their brood along to enjoy the water park and all of the resort's other activities. Other more adult-focused amenities include a full-featured spa, a fitness center, and shops. The family-friendly accommodations include over 450 guest rooms, most of which are configured as suites. An announced second phase will add an additional 400 hotel rooms, expand the convention center and meeting space, and double the size of the indoor water park. The resort has not stated when its second phase would open. The indoor water park is over 100,000 square feet! A second-phase expansion will add an additional 100,000 square feet making the 200,000-square-foot facility the largest indoor water park in the country -- sort of. Signature attractions include a water coaster and a Surfari FlowRider surfing ride. Other water park staples include a wave pool, a lazy river, tube slides, body slides, kiddie slides, whirlpool spas, and a jungle-themed interactive play structure with tipping bucket. There is also an outdoor swimming pool. Like the other Kalahari resorts, admission to the indoor water park is bundled in the room rates for registered hotel guests. Day passes to the water park are available to the general public based on availability.